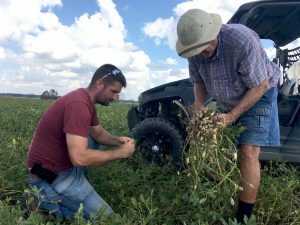 Brad Haire published a second in a series of stories about how Florida and Georgia farmers are coping with the aftereffects of Hurricane Michael. This story, from Southeast Farm Press, tells about the impacts on one peanut worker and has a set of slides which show the devastation of the storm. You can read it and see the images here. University of Georgia Cooperative Extension agent Andrew Warner and peanut consultant Jimmy Miller evaluate peanuts after Hurricane Michael’s trek through Seminole County, Georgia. Previous: EarthSky: How rare are November hurricanes?